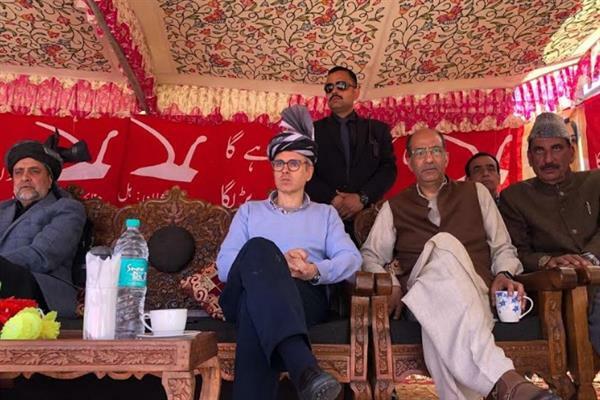 Srinagar: National Conference (NC) Vice president Omar Abdullah on Monday asserted that the party will work towards to get back the coveted posts of Sadr-e-Riyasat and Prime Minister for our state. He also said ensuing parliament elections are significant since it will have direct bearing on the special status of the state saying that State’s accession with the union of India was accomplished in lieu of various constitutional safeguards for the state and if the safe guards are tempered with the entire scheme of accession will be under question. While addressing a public meet at Bandipura, Omar said that Jammu and Kashmir is the only state that executed its accession with the Union of India after securing itself certain constitutional safe guards. “We are not like any another state of India. Every other state got merged with the union of India. We joined our hands with the union on certain conditions unlike other states of India. Does any other state in India have its own flag and constitution? We handshake with Indian union was subject to certain conditions. Today after 70 years forces as are inimical to our status are trying to back track from the conditions. The move will also initiate debate on the fundamentals of accession; there is no second thought about it. It takes two hands to clap,” adding, “After the unconstitutional arrest of sher- e- Kashmir, our special position was unremittingly tampered with to the extent that now it is the pale shadow of what we had achieved from New Delhi, but we would fight any attempt that is aimed to fiddle with our state’s status. We won’t allow any more assail our special status. On the contrary we will strive to get back what was infringed upon. While rebuffing the uncouth statements of BJP president against Art 35-A, party vice president said that no one knew About Art-35 A until I raised it in the assembly.